Home > Migraines > Do Children Get Migraines? Migraine is often thought of as an adult type of headache but it is the most common cause of serious headaches in children and can start from the age of about 6 years. Migraine can be frightening for children and parents and is a common reason for missing school in children and adolescents. It is important to diagnose migraine so that parents can be reassured that the symptoms that their child is experiencing is not due to something more serious such as a brain tumour, cognitive problems or epilepsy. Migraine in children can be much different to adult migraine. Typically, a child with migraine does not get headaches that last as long but they are more likely than adults to get an aura before the headache, or just have aura symptoms alone. The aura can be more scary for children than the headache - it is common for the vision to become blurred and for them to get symptoms such as confusion, loss of speech and vertigo. Very young children who first have a migraine attack find it very difficult to explain what they are feeling. During the headache phase of migraine it is usual for a child to also have abdominal cramps and feel or actually be sick. They may also become very sensitive to light and sounds. One of the earliest signs that a young child of about 5 or 6 is starting to have migraines is that they want to lie down in a dark room during a migraine attack. This is not usual behaviour for children of this age and should always be investigated. As well as migraine without aura and migraine that is accompanied by aura, children with migraine can also have basilar headaches. These involve some head pain but dizziness and fainting due to low blood pressure are the most common signs. Basilar migraines are more common in teenage girls than any other group. It is also possible for children to get hemiplegic migraines, which are particularly frightening as they involve a sudden weakness or even paralysis down one side of the body. Parents or carers often fear this is some sort of stroke. Ophthalmoplegic migraine occurs in children but is very rare in adults - the eyes are affected and the migraine starts with strange and uncontrollable eye movements. Acute confusional migraine affects the cognitive function of children. Many of the symptoms of these rarer forms of migraine are often worrying and parents are convinced that there is another much more serious explanation for them. Do Children Grow Out of Migraines? Some do, but it takes a long time and typically, after starting with migraines at about 5 or 6, a child will continue to experience them through their growing years. 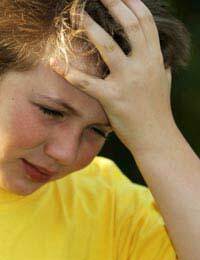 About six in every ten children will find that their migraines stop when they reach puberty, or within a few years. The prevalence of migraine in the adult population is greatest for those in their mid forties and women are more likely to have migraines, particularly chronic migraines, compared to men. One of the triggers for female migraine is menstruation and so migraine tends to decline in later years, after the menopause. Most experts favour minimal treatment for migraine in children as taking regular drugs and medications at such a young age can be more harmful than beneficial. Management of migraine is seen as a family issue - it is common for parents to need more reassurance than their children but it is important that the whole family understands that the symptoms are due to migraine and this is not life threatening. Migraine is serious because of the deep effects it has on quality of life and one of the first steps in treating migraine in children is to try to identify possible triggers so that they can be avoided. Only one in five children has a trigger for migraine that is a food or drink substance; more common triggers are tiredness and stress. Giving the family a routine is important and the child affected needs to have regular sleep, regular meals and to avoid getting tired. When a migraine attack starts it is best to allow the child to lie down in the dark, in a cool room and to let them sleep until the symptoms pass. Taking ordinary painkillers such as ibuprofen or paracetamol can help and these are available in formulations suitable for children. It is not recommended to give aspirin to anyone under 16. Once the family understands the problem and makes some lifestyle changes and deals with attacks in this way, the impact of migraine and often the frequency of the attacks reduces. Iv had p.aura for a long time now. I had to keep a diary for a month to show to my G.P in order for me to be recommended for a brain scan which thankfully came back clear. iv been told that my visual disturbance is migraine related. although a serious migraine headache for me is a rare thing,the visual disturbance,when it happens is very frightening. it can last anything from 40 mins to 3 hours or more,makes my vision almost impossible when its at its worst,makes my heart race and makes me very shakey and nervous. thankfully now,on the recommendation of the neurologist im taking Topiramate 100mg per day. this has really helped a great deal. it hasnt stopped my "episodes" completely,but now they are down to only 3/4 per month. I can never predict when they are going to happen,and iv been told that im not able to drive because of this,for obvious reasons! im no good on the road if I cant see! I thought I would just post this in case anyone else had similar symptoms and were worried.